When I was a young member of the Yogi Magic Club in my hometown of Baltimore, performing at friends’ birthday parties (for a whopping 25 bucks! ), 10-year-old me learned that the power of magic offers something more profound than the illusion itself. Because it’s not about performing magic tricks at kids or saying, “Look how great I am!” It’s about making children the source of the magic – that they have the creativity inside of them. That feeling of wonderment – the “I did it!” moment is the true magic. 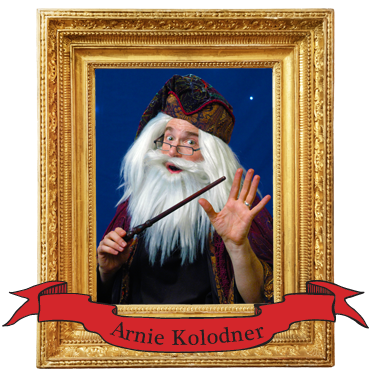 After earning a BFA in Drama from NYU and studying acting at the London Academy of Music and Dramatic Art, as well as starring in many Off-Broadway shows (most notably in Charles Busch’s comedies), I successfully built my international children’s entertainment company (my Magical School for Wizards toured cities throughout Korea and China). In addition, as a featured lecturer at KIDabra – the international convention of professional children’s entertainers – I am constantly learning new tricks and striving for originality, new themes, and ways to interact with my audiences. From birthday parties, school functions, libraries, to corporate family events, I present interactive performances – seamlessly weaving amazing illusions into classic tales. It’s a kind of magic you simply won’t find anywhere else. It becomes a party for parents, as well, because they can finally take a break. No worry, no stress, and no chaos. My team and I effectively immerse children into the environment – they feel invested, involved, and inspired. From the classics to customized themes, by finding magic moments within the stories, I create something memorable for children and adults alike. After all, as I learned back when I was 10 years old at the Yogi Magic Mart, there’s no better or more honest audience than kids. And there’s no better way to inspire children, than helping them see all they are capable of, not to mention a little birthday levitation – something I guarantee will stay with your child long after the party ends. So here’s to empowering your child – one magical moment at a time. Crystal has toured the U.S. and Canada as “Dorothy” in The Wizard of Oz, and as “The Mistress” in Evita. In New York City, she has appeared in Believe (York Theatre), The Spickner Spin (NYC Fringe Festival, Audience Favorite Award), First You Dream (New Amsterdam Theatre), Bohemia on Wry (Theatre for the New City), Red Sky (Henry St. Theatre). Favorite U.S. regional productions include: Godspell, The Buddy Holly Story, A Christmas Carol (Belle), Oliver! (Nancy), Li’l Abner (Daisy Mae), Through the Picture Tube, Bye Bye Birdie, Judy and Mickey (Judy), and The Sound of Music. TV roles include “Paula Ivan” on Parco, P.I., “Elsa Jergins” on TV101 (with Matt LeBlanc), Greg the Bunny, MTV’s Dukes of Hazard spoof, and numerous commercials and industrials. 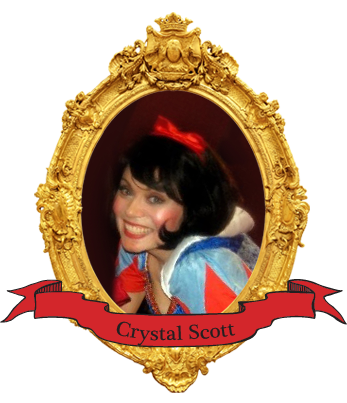 Crystal is a graduate of the University of California, Los Angeles, and currently resides in New York City. 3 Party Favors for Your Harry Potter Birthday (You Didn’t Know You Needed)!